Videos, solutions, examples, worksheets, games and activities to help Algebra II students learn about the probability of complementary events. The following diagram explains how to find the probability of Events and Complementary Events. Scroll down the page for examples and solutions. Sometimes calculating probability can be fairly complicated, but we have tricks to make it easier. 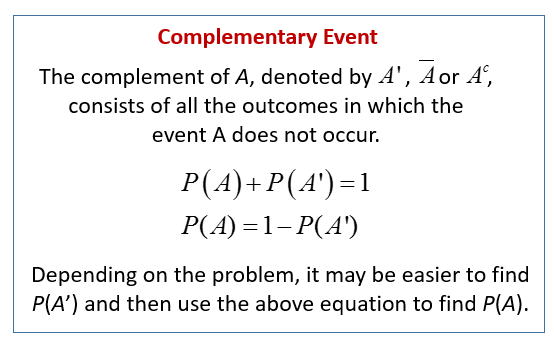 Calculating probability of the complement of an event can be easier than calculating the probability of the event itself. We can use the probability of the complement to find the probability of the event by subtracting it from one. This trick is often used when calculating the probability of multiple events. This video provides two basic examples of how to find the complement of an event. The probability that event A does not occur, is the complement of A. 1. One card is selected from a deck of playing cards. What is the probability that the card is not a diamond? 2. 20 ping-pong balls are numbered 1-20. What is the probability of selecting one ball and it is not greater than 17? How to use the complement to calculate the probability of an event? How to calculate the probability of complementary events? The probability of a 7.5M earthquake or larger in San Francisco during any given year is .02. Assuming independence, what is the probability that San Francisco has at least one earth earthquake in the next 25 years? Three numbers are chosen at random from the whole numbers between 1 and 10 (inclusive) with replacement. Find the probability that at least one of the numbers is an even number. Here we have a typical probability problem: 5 students pick from 12 distinct watches. We find the probability that at least 2 of them pick the same type of watch. We use complements and permutations to find the solution. Each of 5 boys randomly chooses a watch from 12 different styles. What is the probability that at least 2 boys choose the same type of watch? Express the answer as a decimal rounded to three decimal places. This video covers how to find the theoretical probability using the complement of an event. Also, how to find the odds for and against an event is discussed. 1. For a number cube, find the probability of not rolling a number divisible by 3. 2. For a standard deck of cars, what is the probability of not drawing a queen? a) in favor of the spinner landing on an even number. b) in favor of the spinner landing on a multiple of three. c) against the spinner landing on a number less than 5.